In the first quarter, Kungsleden took major steps in its strategic plan. Net sales increased by SEK 707 (487) m and gross profit increased to SEK 408 (281) m.
Profits from property management improved and were SEK 195 (88) m, which corresponds to SEK 1.43 (0.64) per share. Net letting for the period increased by SEK 12 (–5) m.
Cash flow from operating activities was SEK 178 (131) m, which corresponds to SEK 1.30 (0.96) per share. The integration of properties and personnel from the acquisition of properties from GE in December 2013 was completed during the first quarter. The GE portfolio thus contributed to operating net during the entire first quarter. The property portfolio was further refined to bring it in line with Kungsleden’s new strategy and sales were SEK 506 m for the quarter. After the end of the quarter, a further SEK 185 m in sales were recorded. The earnings effect of all sales is estimated at SEK 58 m and will be reported in the next quarter. Kungsleden’s average borrowing cost fell even further during the quarter, primarily due to having restructured the swap portfolio. As of 31 March 2014, the average interest rate was 5.4 per cent, compared to 5.8 per cent at the beginning of the year. Subsequent to the end of the reporting period, the Administrative Court of Appeal notified Kungsleden that it was not entitled to a deduction for certain impairment losses in tax filings from prior years. Kungsleden intends to apply for leave to appeal at the Supreme Administrative Court. During the first quarter, Kungsleden continued to pursue the company’s strategic plan at a quick tempo. Profits from property management improved to SEK 195 (88) m due to larger property holdings and a higher operating net. Gross profit increased by 45 per cent to SEK 408 m simultaneous to a decrease in central and administrative costs, compared to the same period in 2013. Net sales increased to SEK 707 m, of which the income from modular leasing and sales was SEK 141 m. By maintaining a greater focus on our customers’ needs for premises, and supported by a cautiously optimistic rental market, we were able to sign new leases during the quarter for a total of 30,000 sq.m., thus achieving a very satisfactory net leasing result of SEK 12 m. During the quarter, the economic occupancy increased to 91.2 (90.5) per cent and the operating surplus margin increased to 63.7 (62.0) per cent. Refinement and optimisation of the property portfolio is continuing according to plan. During the quarter and after its end, agreements were signed for the sale of non-strategic properties at values totalling SEK 690 m, which exceeds the book value by 10 per cent. At the present time, there is strong demand in the property market along with an under-supply, which is a favourable situation for the sales that we still have planned. Subsequent to the end of the reporting period, the Administrative Court of Appeal ruled negatively on one of Kungsleden’s tax cases (see also page 8). Kungsleden’s strategy is not affected by the Court’s ruling, but the company continually assesses how quickly its strategy can be implemented based on its current options. The company has liquidity at its disposal of SEK 2,940 m. In addition, the profits from property management continue to strengthen the company’s balance sheet and liquidity. Kungsleden’s strategy is to create value by meeting customer needs for premises, managing and developing properties and optimising the company’s property portfolio in order to generate an attractive total return. 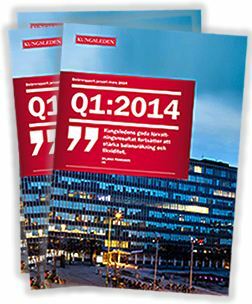 During 2014, Kungsleden plans to divest properties for SEK 1–1.5 billion. This action is in line with the company’s strategy of refining and optimising the property portfolio to its chosen segments – office, industrial/warehouses and retail in prioritised growth regions and locations. Freed-up capital will be reinvested in strategic properties with a high expected total return in the form of higher rental revenue or lower costs, or in the form of declining yields. Over time, our aim is to grow the property portfolio to around SEK 30 billion. Kungsleden AB (publ) discloses the information in this press release according to the Swedish Securities Markets Act and/or the Swedish Financial Trading Act. The information was provided for public release on 29 April 2014 at 8:00 p.m.